True prophets are chosen by the Lord, while false ones are chosen by the devil, who plays upon their pride and unquenchable thirst for self-affirmation. From the time that the Lord God began to call His chosen ones to prophetic service, Satan has not ceased to find false prophets to carry out his dark aims. Biblical prophets were the lips of God. The Hebrew word, nabi and the Greek prophetes mean herald, or messenger, who speaks the word of God and reveals truth inaccessible to natural human reason. A very important personal quality of a prophet is the holiness of his life. The Holy Spirit, Who reveals the future, fills only pure vessels with Himself. "For the prophecy came not in old time by the will of man: but holy men of God spake as they were moved by the Holy Ghost" (2 Pet. 1:21). In Holy Scripture, a prophet is often called a “man of God” (1 Kings 2:27; 3 Kings 13:1; 3 Kings 20:28; 2 Kings 25:7). An unalterable sign of a true prophet is absolute purity of faith and teaching. The heralds of God’s will were those through whom the Lord always enjoined His people to turn away from all false teachings and return to the true path. Prophets were preservers of piety and divinely revealed religion. They were called in Hebrew zophim — guardians (Jer. 6:17; Is. 56:10), who were obligated to warn their people about threatening spiritual and moral danger. The purpose of prophecies was the people’s spiritual benefit. The prophets taught, instructed, and rebuked: "But he that prophesieth speaketh unto men to edification, and exhortation, and comfort" (1 Cor. 14:3). The greatest purpose of all biblical prophecy was to announce the coming of the Messiah, and to historically prepare the people for His coming. Therefore, the meaning of this announcement should be understandable even before the event happens. The Lord revealed to each of the prophets only part of the future awaiting people. The prophets supplement each other. All biblical prophecies taken together make up the great revelation about the Savior’s coming to the world to save it. Only God knows the future. A vision of the future is not accessible to humans with their limited natural abilities, neither is it accessible to the demons. Amongst the writings left by M. Nostrodamus to posterity is “A Letter to the Canons of the Town of Orange” (dated Febuary 4, 1562). The Canons (clergy of the cathedral) turned to him in connection with the theft of sliver sacred objects from the cathedral. Instead of admitting that he did not know anything, M. Nostradamus had recourse to the usual occultist trick — empty complexity of words. “About your inquiry as to the blasphemous thefts which you named and recounted, with respect to the theft and treasure of the closed, but not hidden (!). According to the astronomical drawing shown above, you can clearly see that the theft of the sacred objects was performed by the allowance of two of your brothers in the church; precisely those who earlier many times expressed the opinion as to what happened to your silver. One of them supposed that it was taken to Avignon, while the other said that it had ended up in some other place. Both considered that it had already been sold, for that was their intention. The booty was to be divided between the canons, who are now like soldiers. This opinion was not good and pious. Some did not agree with him, although others were satisfied, but in the end they were not in agreement with one or another point. However, everything stopped when the silver was taken to the house of one of your people and locked up there. But a certain person did not like this. One of the opinions was that the silver should be melted down into bricks and sold, having stored it in one of their houses for the time being. Then, two or three expressed that this would be impossible over the course of a long time, for the Roman Catholic Church will be drawn into the most awful events. Thus, it (the silver) was locked up, although two of them retained the opinion that it should be melted down into bricks and sold, having been stored temporarily in one of their houses. There were only three, and they are brothers of the Church, and they spirited off, what is faultless, intending to steal it, not without the collusion of its guardian, for you had entrusted the lamb to a wolf… But be aware, worthily respected seigneurs, that those of you who know when the theft of the sacred objects took place, and if they are not returned in their entirety—not into the hands of those to whom they had been entrusted, but directly to the church, upon you will be visited the greatest calamities that have ever happened to men; upon you, and upon your families. Furthermore, a plague will come to your city and spread within its walls, and therefore let them not resist. Commiltones quornodo dii propicii sint sacerdotes (Priests are like the comrades of well-inclined gods), but will see how God will punish those who defiled His holy church and stole what people had sacrificed in ancient times. Therefore, read this letter of mine to the gathering of all your people (but do not open it until all have assembled), and then the faces of those who are mixed up in this work will immediately express great shame and confusion, for they will not be able to hide their feelings. Preserve this my letter as full testimony of the truth (the future will show it), and I assure you, worthily honored seigneurs, that if what was stolen is not returned in one way or another, they will die the most pitiful, torturous, and slow deaths, with such sufferings as none of them has ever had to endure — if the silver is not returned to its former places of storage; and you will see that that is how it will happen. I am angered that the lamb was entrusted to a wolf, and I have written my letter out of that. What I have written to you corresponds to astronomical calculations, but I express, not wishing to insult anyone in the world, that humanus sum possum errare falli et decipi (I am a man and can make mistakes, be wrong, and deceived). Nevertheless, if there is anyone in your city who is acquainted with astronomical teachings, let them look over my drawing. If he understands this business he will see that I am speaking the pure truth. Do not doubt, seigneurs; everything will soon be found. And if this does not happen, be assured that a bitter fate awaits those who committed this monstrous crime. I cannot tell you any more right now.” (This English translation is from the Russian, translated by V. Burbelo and E. Solomarskaya). I have cited this long text in order to show that this “clairvoyant” demonstrated indubitable mastery in the art of speaking many words without really saying anything. However, one important result can be observed: confusion and mutual suspicion was introduced into the midst of the cathedral clergy. This is just what the devil needed. “It is true, at first even I did not believe in my ability to foretell the future, which comes from my natural abilities inherited from my forebears. I continually underestimated this instinct of mine; nevertheless, I then made my spirit and soul receptive, and adjusted and integrated it with long calculations. Making my soul to be at peace before the face of eternity, I freed my soul, mind and heart of all care, solicitude and vexation. I summoned the courage, strength, and patience, which are necessary conditions for prophecy. All structure and harmony of prophecies are achieved in part by a bronze tripod” (see above). M. Nostradamus is speaking of a ritual tripod which was used in pagan occult practice. A Pythia (priestess) of the Delphi would sit upon a tripod that stood over a chasm out of which arose intoxicating vapors. In a frenzied state, she would become part of the whole mysterious nocturnal ritual, and make prophecies. There were times when the priestess would fall from the tripod and continue prophesying in a state of delirium. Incidents were recorded when the Pythia lost consciousness and died. 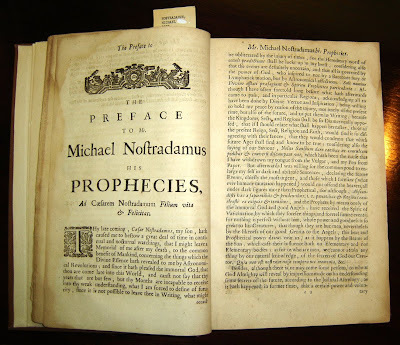 In the first two quatrains of his Centuries, M. Nostradamus leads the reader into his occult practice, the fruits of which were his “prophecies” (the following translations of the Centuries were taken from the website http://www.sacred-texts.com/). The seer is describing a magic ritual known from the work, De Mysteriis Aeguptorum (“On the Egyptian Mysteries”) by Iamblichus Chalcidensis (c. 245–c. 325; an ancient Neo-Platonist philosopher, astrologist, sorcerer, and soothsayer). It is well known that M. Nostradamus was very interested in the symbolic pagan knowledge of the Egyptians. His manuscript, Explanation of the Hieroglyphs of Horapollo were discovered relatively recently. It is quite obvious that M. Nostradamus was not a prophet of God, and the Lord did not reveal the future to him, "For what concord hath Christ with Belial?" (2 Cor. 6:15). Demons do not know the future. “Prophecy is for the most part a work of God which demons cannot even imitate, no matter how hard they try. There can also be a certain delusion in miracles, but to accurately foretell the future is something characteristic of the Eternal Being alone. 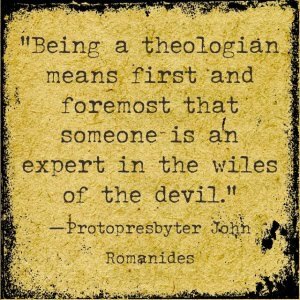 If the demons have ever done this it was only to seduce the foolish, and therefore their predictions can easily be exposed as lies” (St. John Chrysostom, Discussions on the Gospels of the Holy Apostle John the Theologian, 19). St. Anthony the Great says that the demons give themselves out to be predictors of the future. “They have no fore-vision of what has not yet happened. Only God is the ‘knower of all things before they be’ (cf. Dan. 13:42). The demons, however, are like thieves who run ahead, then report what they saw. Even now, they will go and tell many others about what we are doing — how we have come together and are talking about them — before any of us leave this place and tell someone about it. But the same could be done by some sprightly boy who outruns someone walking slowly. And I tell you exactly. If someone should intend to walk from the Thebaid or from another country, until he sets off, the demons do not know whether he will go or not; but as soon as they seen him walking, they run ahead and tell someone about him before he arrives, and they who are walking really do arrive in a few days. Often it happens that the one who set out to travel goes back, and then the demons turn out to be liars. Thus, sometimes they will pompously announce something about the waters of the Nile because they have seen that there was much rain in the land of the Ethiopians, and knowing that flooding in the river can come from that, they run ahead and foretell it. People would say the same thing if they could travel so swiftly from place to place as the demons. And like David’s guard who went up into the heights before those below and saw what was happening, then going ahead more swiftly than the others, related not something that had not yet happened, but what had already occurred, and the news of which was already approaching (see 2 Kings 18:24–29), the demons also take upon themselves the task of letting others know, only in order to seduce them. If Providence should be pleased to do something else with the waters or the travelers at that time (because this is also possible), then the demons will be shown to be liars, and those who listened to them will have been deceived. That is how the pagan oracles worked; that is how people have been deluded by the demons since long ago” (St. Athanasius the Great, The Life of Our Holy Father Anthony). Thus, a divine source of knowledge of the future was not accessible to M. Nostradamus; whereas the demons, with which his occult practices connected him, do not know the future. Then just what are his divinations? They were made in verses — four lines each, which he called quatrains. The quatrains are grouped into Centuries (one hundred). Ten centuries are complete and two (XI and XII) are not. There is also what is called the 1001st quatrain. There are in total 968 quatrains. Unlike the biblical prophecies, the quatrains do not have an inner unity. They have a chaotic and arbitrary look to them. In his letter to his son, Cesar, Nostradamus writes, “Sometimes I am overtaken by inspiration and ecstasy several times per week, and then, during nighttime vigils, I compose books of prophecies by way of lengthy calculations. Every such book contains hundreds of astronomical quatrains — predictions which I then collect into one and codify. This is an unending prophecy up to the year 3797.” The use of the word “codify” with regard to the text does not inspire trust. This is a typical occultist trick — to suggest the thought that there is a great “mystery” here. From the point of view of true prophecies, similar codifications look senseless. Why are they done, and for whom? Furthermore, we know that, "There is nothing hid, which shall not be manifested; neither was any thing kept secret, but that it should come abroad" (Mk. 4:22). One well-known information specialist, the creator of the science of cybernetics, Norbert Wiener, expresses a similar thought with respect to his own field. “There is no system of code or cipher that cannot be deciphered over a specific period of time, while containing possibly a significant volume of information, and not just a few lines of fragmentary solutions” (N. Wiener, Cybernetics and Society, Moscow, 1958, 129). 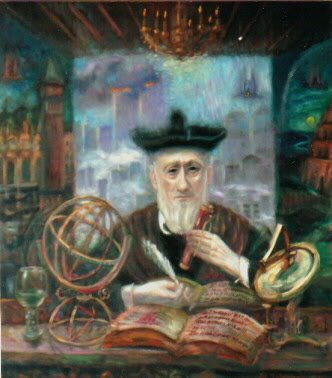 Even the most fanatical supporters of the famous sorcerer understand that his “prophecies” do not state anything concrete, and therefore, wishing to defend their beloved seer, they have been searching fruitlessly for four and a half centuries for the non-existent “cipher” which could explain Nostradamus’ disjointed words. One more detail draws attention to itself: M. Nostradamus’ vision reaches to the year 3797. From the point of view of Christian eschatology, this is nonsense. The time of the Second Coming of the Savior of the world and the end of the world is not known to people or angels. It could happen at any time. "Watch therefore, for ye know neither the day nor the hour wherein the Son of man cometh" (Mt. 25:13). From this it is clear that the year 3797 is an arbitrary date. Finally, we must decisively state that there has not been a single prediction of Nostradamus’ that has actually come true. All of his predictions were expressed so vaguely and indefinitely, that they could correspond to an enormous number of the most varied events. Could even one of this famous magician’s most blind followers actually say what is predicted in these lines, and when they came true? As we can see, any one of the assertions made in the quatrains could be interpreted in any number of different ways. Therefore, it is not difficult to apply the prediction to any event. Not one follower of Nostradamus has ever made a single real prediction using his “prophecies.” The king of soothsayers and seers is completely naked. People who get caught up in M. Nostradamus’ prophecies unavoidably partake of the same dark, demonic source that provided inspiration to the author of the Centuries. "Thus saith the Lord God; woe unto the foolish prophets, that follow their own spirit, and have seen nothing!" (Ezek. 13:3).